Our corded oscillating multi-tool reviews cover products that really do things no other tool can accomplish. For example, corded oscillating multi-tools make undercutting doorways easy. They excel at replacing those undercutting hand saws that get the job done, but take forever. 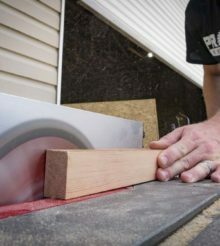 When laying tile, wood flooring, or linoleum, make undercutting a doorway with a corded oscillating multi-tool step one. Knowing which of these tools will get the job done quickly can save you a lot of time and effort. Check out our cordless oscillating multi-tool reviews if you need more freedom. Rather than simply review the oscillating multi-tool accessories, we give a clear picture of how each of the multi-tools will work for a tradesman. We do this by ensuring we use the same accessories whenever possible. One of the newest systems is the Bosch Starlock multi-tool accessory system. This system matches the Fein Starlock oscillating multi-tool system. With the advent of universal multi-tool accessories, this is becoming more and more possible. It definitely evens the playing field. That allows us to test true cutting speed, vibration, and other features of the tool. Then, we can stop wondering whether the oscillating multi-tool cuts quickly—or if the blade makes it fast.